This professional-caliber 500mm super-telephoto prime lens stops distant action in in its tracks. Featuring Nikon’s superior Vibration Reduction (VR II) image stabilization and performance enhancing lens technologies, superior NIKKOR optics and a lightweight magnesium die-cast barrel with dust and moisture resistance, it’s ideal for photographers in the field shooting motor sports, outdoor athletes, wildlife and much more. Nikon VR (Vibration Reduction) image stabilization provides 3.0 stops* of blur free handheld shooting, assuring dramatically sharper still images and HD video capture. With 500mm of super-telephoto reach, there isn’t much you can’t capture with the AF-S NIKKOR 500mm f/4G ED VR. Whether you’re on assignment at a race or after elusive critters in the wild, you can expect brilliantly crisp and dramatic images in rich color and amazing detail. Plus, the AF-S NIKKOR 500mm f/4G ED VR is fully compatible with all Nikon Teleconverters, so you can double the effective reach. 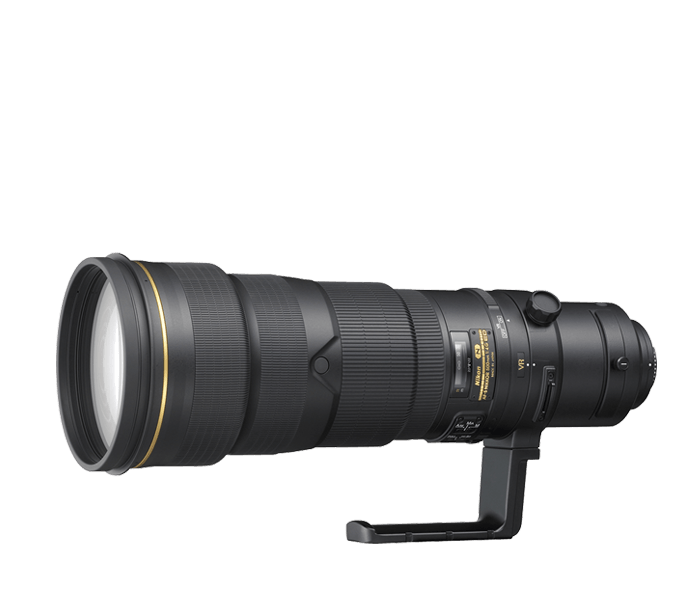 The AF-S NIKKOR 500mm f/4G ED VR is a workhorse on the track and in the field. Its rugged, lightweight design features a magnesium die-cast barrel and professional-grade dust- and moisture-resistant construction. It’s also host to an arsenal of innovative Nikon lens technologies like Vibration Reduction (VR II) image stabilization with tripod detection mode for minimizing shutter release vibration, Silent Wave Motor (SWM) for ultra-fast, ultra-quiet autofocusing, exclusive Nano Crystal Coat (N) and Extra-low Dispersion (ED) glass for superior color, sharpness and contrast. Even in the most demanding shooting situations, the AF-S NIKKOR 500mm f/4G ED VR performs brilliantly.